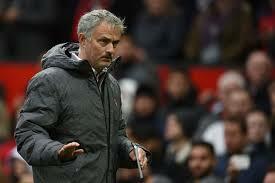 Manchester United manager, Jose Mourinho has revealed that he congratulated Pep Guardiola after the latter’s side lost 3-2 at The Etihad on Saturday. City went two goals ahead early in the Manchester derby at the Etihad but were pegged back by an incredible second-half performance from United. United scored three times after the break, with Paul Pogba netting twice and Chris Smalling grabbing the winner. The United boss embraced Guardiola at full-time on the touchline and praised City’s performances this season despite Saturday’s defeat. Asked if he congratulated Guardiola on winning the title when they shook hands, he confirmed, “Yeah, [I said] congratulations for the title, they deserved it, more points than others, they gave no chance to the others. “I keep saying we’re doing a better season than last season, more points, more victories, more goals, less goals conceded but everything was better for us but it was not enough because they had this season of don’t stop winning. “But we are not the team people think we are, not as bad as people think we are, not as bad a manager as people think I am, the players aren’t as bad as people think they are. United’s victory at Etihad means they have closed the gap to 13 points. It also means that Pep Guardiola’s side now need two victories to win the title.